A design aimed at the pursuit of lightness, through the adoption of an elemental style. Fli is a fixed or extending table with steel legs, chromed or painted glossy white, glossy black, matt silver, or matt anthracite grey. 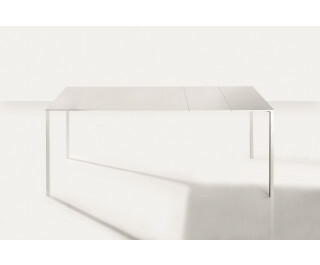 The table top is available in white painted extra light glass, or in an innovative lightweight and resistant material, with white laminate finish. Fli is equipped with independent manual extensions that increase the support surface according to requirements.